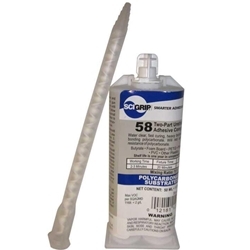 VOC-free, two-component 1:1, fast-setting, reactive, urethane-based adhesive for bonding polycarbonate, butyrate, ABS, and PETG to themselves and each other. Excellent UV light resistance. Does not alter the impact resistance of polycarbonate.